DISPLACED Q: Is the “noble savage” trope still relevant to today’s expats? As the July theme for The Displaced Nation is Pocahontas, it seems a fitting moment to ask whether tourists and expats still cling to some kind of notion of the “noble savage” in the countries where they visit and live. The answer of course should be a resounding “no” — because today’s global nomads (or anyone for that matter) have no business treating the people they meet in other countries in a condescending, racist manner. To quote from Merriam-Webster to give a brief introduction to the underlying idea, the noble savage is a “mythic conception of people belonging to non-European cultures as having innate natural simplicity and virtue uncorrupted by European civilization.” It’s an idea that was wonderfully useful for racist scientists in the 19th century. It romanticizes primitivism. Most expats these days seem to be fairly well-educated, well-positioned people who either for reasons of career, lifestyle or marriage have moved to another country. Although there may be constant befuddlement and discombobulation at living in another country, you probably have some existing frame of reference for wherever you are going and for what sights you will see. You are inescapably a product of the late 20th and early 21st centuries — and I would argue that the noble savage trope absolutely has no relevance to you. EDITOR’S NOTE: But is awindram right — or do some of you romanticize the natives in the countries where you’re staying? 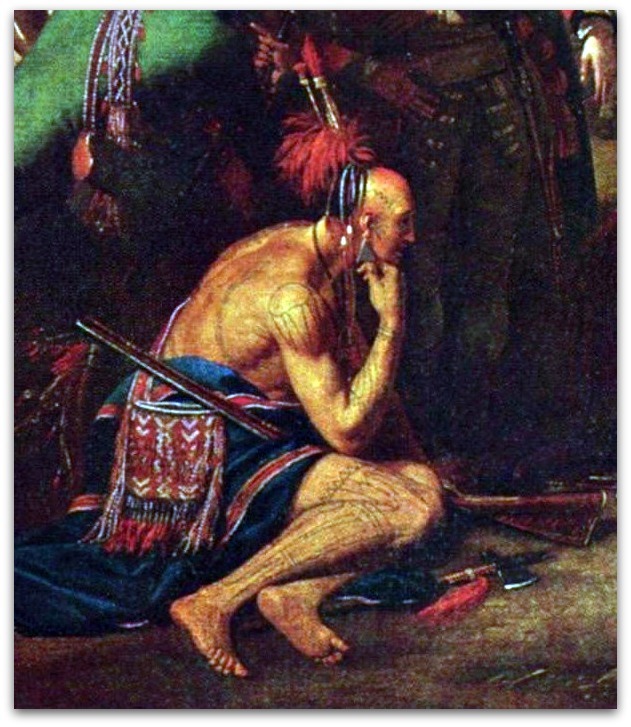 img: Cropped version of Benjamin West’s “The Death of General Wolfe,” showing the Native American — a portrayal that has often been cited as an example of the “noble savage,” courtesy Wikimedia. Interesting that you assume expats are the one to bestow the title noble savage when in many countries we are the ones to receive it–or ignoble as the case may be. As far as the “ignoble savage” goes, I have the feeling I know which group you’re referring to! We are moving on to this topic shortly — stay tuned! For that matter, I think that foreign women are also occasionally the object of non-Western males’ fantasies — so we may need a term for us as well. “Exotic foreign ladies” or some such? I wish I could subscribe to your assertion that the noble savage trope has died out, but I fear I cannot. From where I sit, watching global travelers coming and going, it seems to be alive and well. “Noble savage” is after all a trope that implies “love-hate” — and in my experience this kind of paradoxical thinking towards other cultures abounds. 1) The Eat, Pray, Love phenomenon — or, more specifically, the Western obsession with India and spirituality, implying that you can’t nourish your spirit unless you visit India. Meanwhile, of course, most Indians live in rather miserable conditions, and Westerners at some level look down on them for this. 3) Continuing appropriation by whites of Native American spirituality, animal wisdom and so on — while not particularly caring about how the Natives have been marginalized by white culture. A great example of this is the Cherohonkee phenomenon. A combination of “Cherokee” and “Honky”), Cherohonkee refers to “a special breed of New Age Baby Boomers who have a unique affinity for turquoise jewelry, wolves, and Native American culture.” But although they share the Native American’s respect for Mother Earth, they tend to be distrusted by Native Americans, who don’t think they really get it. Indeed, not much has changed since Pocahontas’s time! Janet, did you take that quote from somewhere or make it up? Impressive! Gee thanks, ML, mine all mine. Re number 3, ML – compare the Crocodile Dundee happy portrayal of indigenous Australians compared to the reality of their treatment by the Australian state and federal governments. Aboriginal children – The Stolen Generations – were still being removed from their families by governmental agencies as late as the 1970s. But you’re twisting what I wrote by writing “I wish I could subscribe to your assertion that the noble savage trope has died out,” when I, in fact, wrote that it has absolutely no relevance to a modern expat. I’ve noticed that most male EFL teachers in China have a peculiarly racist view of Chinese women. But “yellow fever” and “jungle fever” been discussed to death on Racialicious. I invite you to “come in” to today’s post, on a Western man’s pursuit of utopia in Thailand. A very one-sided argument, however. I think you could have come up with some similarities if you had given it a tad more thought.